The ProfileTailor™ suite includes a sophisticated Workflow Management engine, along with a number of pre-built workflows that can fully automate the processes involved in managing your starters, movers, and leavers. New workflows can be easily created to perform all manner of tasks. Workflows typically consist of trigger steps, approval steps and action steps. The Workflow Management engine can accept automated triggers, from systems such as SAP HR/HCM, SAP ECC or Microsoft AD, and then execute a number of actions based upon these triggers. For instance ProfileTailor™ could detect a new employee record created in SAP HR and then automatically, based upon the employees job title; create a new user in SAP (along with the correct licence classification) an entry in Microsoft Active Directory; provision the correct SAP authorizations and Domain Group for their job; automatically send requests to Facilities Management to provision building access, laptops; and execute any other processes that need to be performed. ProfileTailor™ can work across multiple systems, platforms and applications - even cloud applications, for instance creating Salesforce users via API or SOAP calls. All manner of actions can be performed automatically within your systems such as creating/changing/deleting users, running transactions in SAP, provisioning roles or attaching users to AD Domains, etc. The system can detect the movement of employees and instantly act upon it, ensuring that their authorizations stay within the confines of their job role. For instance, removing old authorizations and provision new ones based upon their new role, and thus ensuring that Segregation of Duties rules are maintained as employees move around the organization. ProfileTailor™ can also detect dormant users and can execute automated processes to lock their access and invalidate their SAP licence. 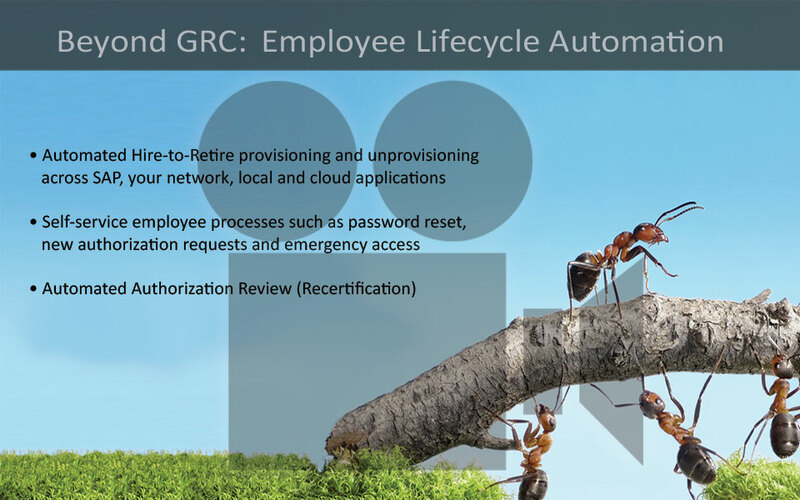 The system also has a web portal for users to initiate employee lifecycle processes themselves; for instance new user requests, new authorization requests, immediately lock all system access for a user etc. Needless to say, all processes are fully traced and auditable.